The spiders extremely large anterior median eyes have excellent color vision and combine with their bright colors to make peacock spiders cute enough to cure most people of their arachnophobia. But these displays aren't just pretty to look at, they also inspire new ways for humans to produce color in technology. One species of peacock spider – the rainbow peacock spider (Maratus robinsoni) is particularly neat, because it showcases an intense rainbow iridescent signal in males' courtship displays to the females. This is the first known instance in nature of males using an entire rainbow of colors to entice females. 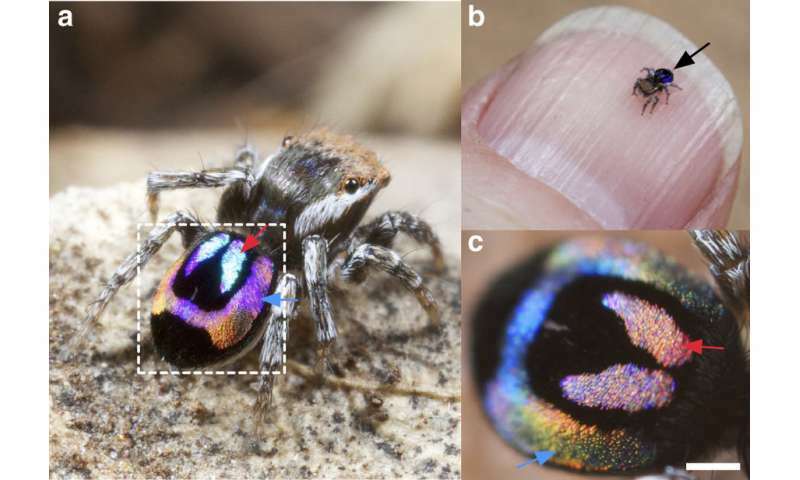 Dr. Bor-Kai Hsiung led an international team of researchers from the US (UAkron, Cal Tech, UC San Diego, UNL), Belgium (Ghent University), Netherlands (UGroningen), and Australia to discover how rainbow peacock spiders produce this unique multi-color iridescent signal.